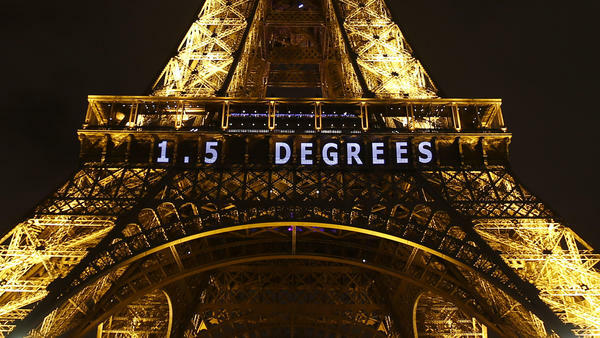 One target for limiting global warming — "1.5 DEGREES" — is projected on the Eiffel Tower on Friday as part of the United Nations Climate Change Conference in Paris. Representatives from 196 parties made a historic pact Saturday, agreeing to adopt green energy sources, cut down on climate change emissions and limit the rise of global temperatures — while also cooperating to cope with the impact of unavoidable climate change. The deal still needs to be adopted by individual governments — but the acceptance by the diplomats gathered in Paris has been hailed as "transformative." Island representatives adopted the oft-repeated motto, "1.5 to stay alive," as NPR's Ari Shapiro reported earlier this week. "To help developing countries switch from fossil fuels to greener sources of energy and adapt to the effects of climate change, the developed world will provide $100 billion a year," NPR's Chris Joyce, who has been covering the climate conference, reports. "Developed countries won inclusion of language that would up the ante in subsequent years," Chris explains, "so that financial aid will keep ramping up over time." "Each country came to Paris with a voluntary pledge to reduce emissions," Chris says. "The agreement now codifies that and sets a framework for those reductions to begin in 2020." "Targets must be submitted 9-12 months before they are finalized, creating time for other countries and civil society to seek clarity about the targets submitted," the administration writes. The agreement still needs to be approved by the individual governments of the countries involved. But the U.N. won't be waiting for all 196 parties — 195 countries and the European Union — to give the green light. Countries have from April 22, 2016, to April 21, 2017, to officially sign on to the agreement. Once at least 55 nations — representing, between them, at least 55 percent of the world's total greenhouse gas emissions — have signed on, the pact can go into effect. It will kick in 30 days after that requirement is met.